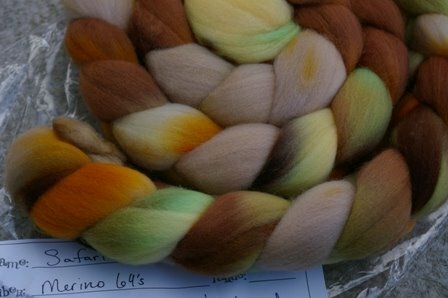 The above is colourway Safari, the below is colourway Frankincense. I came face-to-face with the realization on Monday that I am not a true spinner yet. I have been looking for a certain colour of purple for the past month or so. The number of different “colourways” of “purple” is astounding. Let me just say, I am glad it is not my job to decide whether a ball of yarn is mauve vs. lavender vs. grape vs. the list goes on and on . . . Actually, I would love to be that person, but the point is: I was having a lot of difficulty finding the right colour of purple for a particular project that has been festering in the back of my mind for a while. On Monday, I was in the LYS and bumped into a friend from Knitting Group. I told her what I was looking for and she said “Why don’t you spin the colour you want?” Duh. 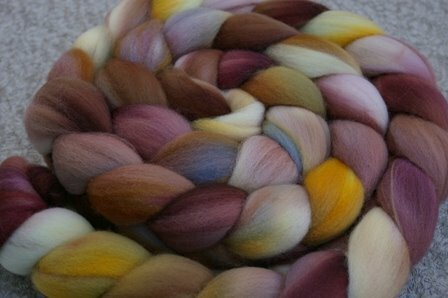 The LYS that I tend to frequent has recently started selling roving. They happened to have the above bag sitting quite nicely on the shelf. It’s Shades of Narnia from out in Chilliwack, BC, in the colourway Purple. So simple. So perfect. It’s the colour I had been dreaming about! I am so jealous of you spinners! Frankinscense is particularly beautiful.